Chesterman Beach is two and half kilometers of packed sand stretching between rocky headlands just south of Tofino, and just outside the door of Chesterman House. Edged by lush rainforest, the beach ends in colossal caves and crevasses in the southeast. At low tide, a sandy spit appears in the centre of the beach creating a path to Frank Island, a ten minute walk away. From misty sunrise to golden sunset there is no end of things to do on Chesterman Beach. One of the finest beaches on the west coast of Vancouver Island, Chesterman is an extraordinary location for activities from the extreme to the serene. The high, pounding waves of the open Pacific Ocean provide a wild ride for surfing. Frank Island and the rocky headlands are fascinating places for kayaking. Swimmers and waders can frolic in the exhilarating surf. Out at sea, the migration of grey whales and orcas is an awesome sight to witness and local whale watching companies will take you close to the action. For an unforgettable experience, charter companies will take you fishing and boating in the waters around this rugged area. During winter, the fierce power of Mother Nature crashes into the island and the beach. Winds and rain pummel the coast and storm watching will delight the adventurous among us. Wildlife is not in short supply around the beach. Birdwatchers are rewarded with eagles and ospreys circling above and shorebirds scuttling along the sand playing with the waves. Tidal pools in the rock formations are full of sea life and local naturalists offer tours to explore their secrets. Even after dark the beach offers many enchantments. Far from city lights, the night sky comes alive for stargazers, and on moonlit nights the moon’s glistening reflection dances upon the water. Beachcombing and hiking along the beach provide many sights, sounds and treasures. Picnics and sandcastle building, daydreaming and meditating, romantic walks and gazing at sunsets or stars; Chesterman Beach is a breath-taking location for families, friends and lovers. 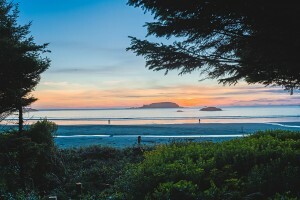 Chesterman House and Beach are located near Tofino, Ucluelet and Pacific Rim National Park which provide excellent opportunities for fine dining, golfing, shopping and more hiking.